rtop is a simple, agent-less, remote server monitoring tool that works over plain SSH. It does not need any software to be installed on the server that you want to monitor. 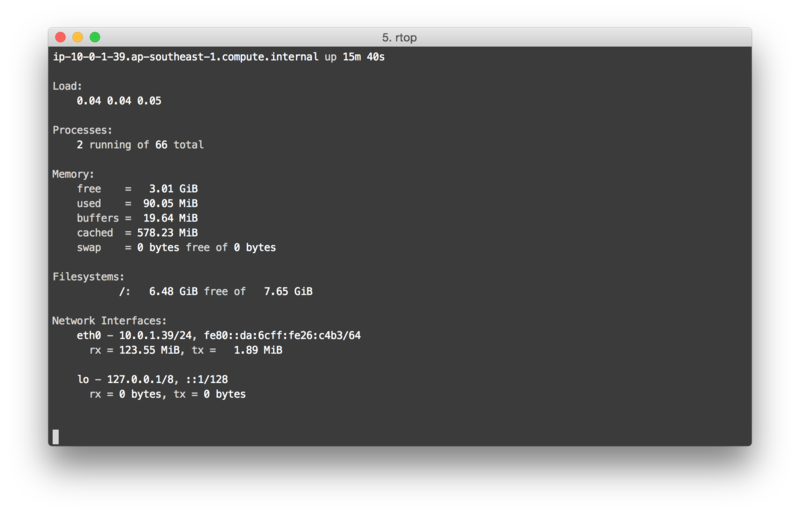 It works by establishing an SSH session, and running commands on the remote server to collect system metrics. OpsDash - Server, Service, Database, Application Metric Monitoring and Alerting solution all in one. SaaS monitoring service at $5/server/month. rtop should be able to monitor any modern Linux distro, and should be able to run on all platforms that Go supports. It runs with some limitations on Windows too. You might also like the related project rtop-bot, which has a Slack and HipChat bot frontend for rtop. Feel free to play with the software, and send us pull requests and bug reports to keep the party going! Cheers from RapidLoop! Shameless Plug: OpsDash is a server monitoring, service monitoring, database monitoring, application metric monitoring and alerting solution by RapidLoop. Avaialble in SaaS and self-hosted versions. Try it out today!